Catriona and James are desperate for children, and embark on an IVF program. After a gruelling round of treatments, Catriona finally falls pregnant, and they donate their remaining embryo anonymously.Diana and Liam are on a waiting list to receive an embryo. Sooner than expected, they are thrilled to discover one is available.After a difficult pregnancy, Catriona gives birth to Sebastian. But severe postnatal depression affects her badly, and quickly turns into deadly psychosis. For her protection and her baby’s, she’s admitted into psychiatric care. When she comes home, she again struggles to bond with her baby, but gradually life finds its own rhythm.Meanwhile, Diana has given birth to a beautiful little boy, Noah. But when he is two months old Noah is abducted … and Diana and Liam’s nightmare begins. 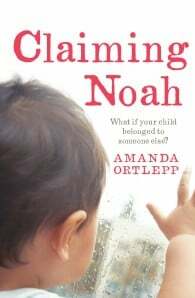 Amanda Ortlepp always wanted to be a writer, but it took thirty years and a decade of working in marketing and communication roles before she started writing her first book. That story was abandoned after a few months because Amanda stumbled across the topic of embryo donation and quickly became fascinated by it. She started writing a new book, which eventually became Claiming Noah. It is set in the inner west of Sydney, where Amanda lives and works. Amanda is currently working on her second novel, set on the remote Eyre Peninsula in South Australia where her father grew up and where many other members of her family have lived.